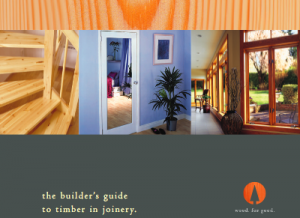 Joinery timber is used in finished product manufacture, as distinct from construction, with softwoods and hardwoods from the sustainably managed forests of Scandinavia and Europe being most commonly used in the UK. Slow growth trees, typically from the Nordic countries, provide fine-grained dense wood, ideal for conversion to a wide range of quality furniture types and components. The two main species are Pine (Pinus sylvestris), known as redwood, and Spruce (Picea abies), known as whitewood. Both species share long cell fibres and a relatively high strength-to-weight ratio. Both are easy to work, glue and nail, although Spruce has harder knots. Pine’s heartwood is a distinct reddish colour and naturally more durable than the sapwood. Spruce’s heartwood is very similar to its sapwood, but Spruce’s overall cell structure absorbs less moisture, making it suitable for outdoor use.